Can gardening change the world? It certainly can when it comes to butterflies. Butterflies are in danger, but everyone who has a garden can do their part to make a difference. Gardening for Butterflies is an optimistic call to arms by the experts at the Xerces Society that provides home gardeners with everything they need to create a beautiful, beneficial, butterfly filled garden, no matter the size of their space. Hundreds of plants for all of North America are profiled, with colour photographs and growing information, along with tips on plant selection, installation and maintenance. 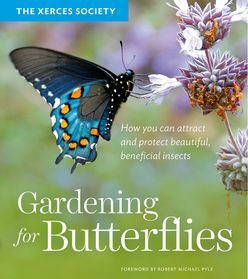 An illustrated guide to butterfly gardening from the Xerces Society, the leading organisation in pollinator conservation.